Gah, I’ve become terrible at keeping this blog updated. We all knew it would happen, didn’t we? I started off posting regularly. Then I thought I’d just do one per country. Now I’m not even doing that. So it’s about time I did an update mahoosit. It was an odd one. 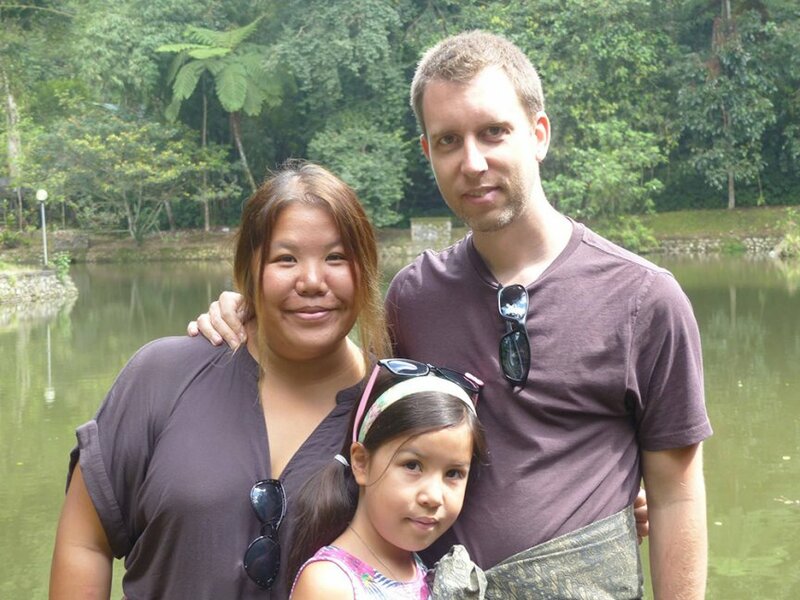 We arrived knowing we’d only be there for a month, as a kind of stop-gap before Bali, which was already booked. I also knew I’d be gone for a week to San Antonio, Texas, for a conference. 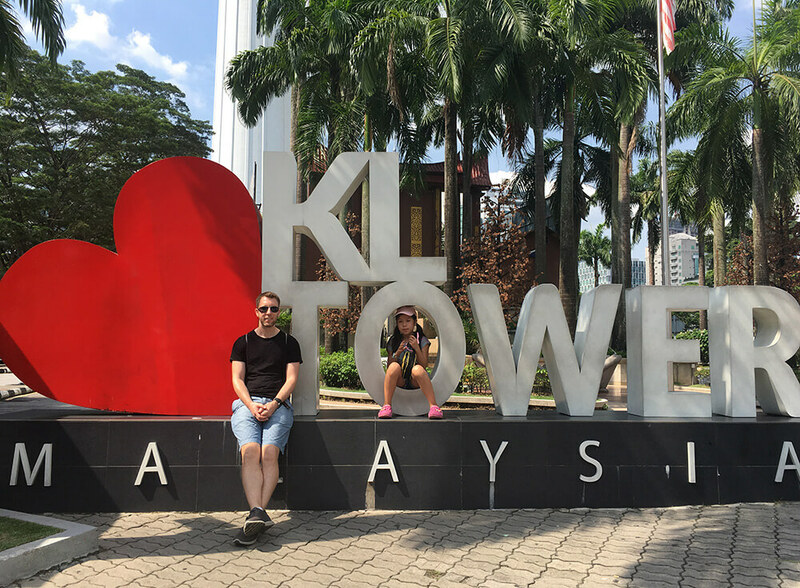 So we didn’t ever really fully commit to integrating into life in Kuala Lumpur. Our flat was in one of those skyscrapers with it’s own gym, and an infinity pool that looked out over the amazing KL skyline. Well, it did 12 months ago. Like much of KL, someone thought it would be good to keep building, and plonked another skyscraper directly in front of us, blocking the amazing view, and turning the whole area into, basically, a building site. In the end, that didn’t take away too much from the fact that we had our own pool and gym in the complex, which was awesome. I also had a quiet space (officially called a reading room) where I could work from. The flat itself was basic but fine. I could also walk about 15 minutes to a Starbucks, which was another place to work. It was such an effort getting into the centre, the traffic in KL is awful, so commuting to a co-working space was out of the question. So, KL probably won’t be one of the more memorable places on our itinerary. But we did enjoy things like the banana leaf curries, the board game cafe, and going to the ancient Hindu caves, among other things. We also bought a ukulele! Oh, Bali. A game of two halves. It started off in Ubud, in a paddy field, surrounded by frogs, 10 minutes walk from the nearest main road. It ended in Sanur, in a beautiful seaside villa near the beach. This was another stretch of my comfort zone – and it was a long time before I got used to being in Bali but eventually, we all fell in love with it, I think. Where we lived in Ubud was very odd. 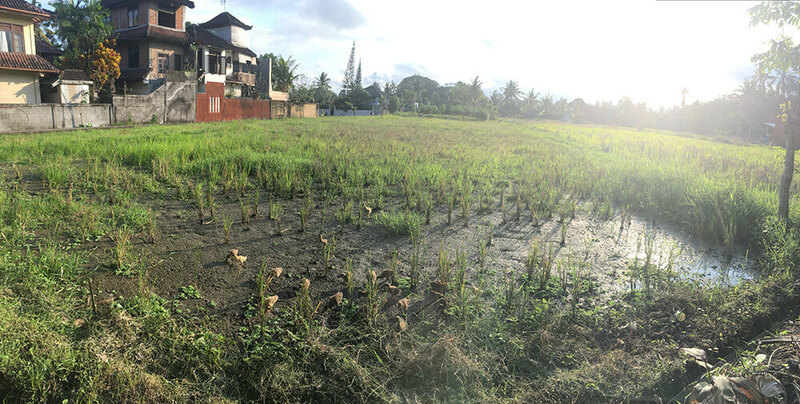 Although we were essentially stranded in a small villa in the middle of a load of rice fields, there were still half a dozen restaurants for tourists within walking distance. Which was a good thing as our kitchen was very basic. And Ubud itself was not walkable, so we ended up taking motorcycle taxis into the village. My co-working space was pretty unique though, overlooking a paddy field on one side, and the monkey forest on the other. Often I would work with the sound of monkeys running across the roof. Ubud reminded me of some places in Cornwall, strangely. It’s become so full of tourists, and has that hippy, new age vibe. Like Cornwall, the infrastructure just can’t cope with the number of people, so there’s constant traffic jams and the pavements and roads are full of holes. Despite that new age vibe, we managed to find the only church in Ubud and made some good connections there. A month later, after a short break for me to go to San Francisco for work, we moved to Sanur, in the south of Bali, near the coast. We’d booked an absolutely stunning 3-bed villa with it’s own swimming pool (and house staff!). Knowing that the Baynton family would be staying with us, this was an indulgence but worth it to have the space for both of our families. And I took a 10 day holiday, my first substantial time off for a while. And I say indulgence… it cost only slightly more for the month than our mortgage in the UK. So Nic, Andy, Caitlin and Bethan arrived and we hung out for the summer, just like we did a year ago in Croatia. It’s so easy to be with these guys and great for Roobs to have friends living with her for a bit. Andy and I went running along the beach together (mostly together – he’s much faster than me). We ate amazing Italian gelato at Massimo’s. 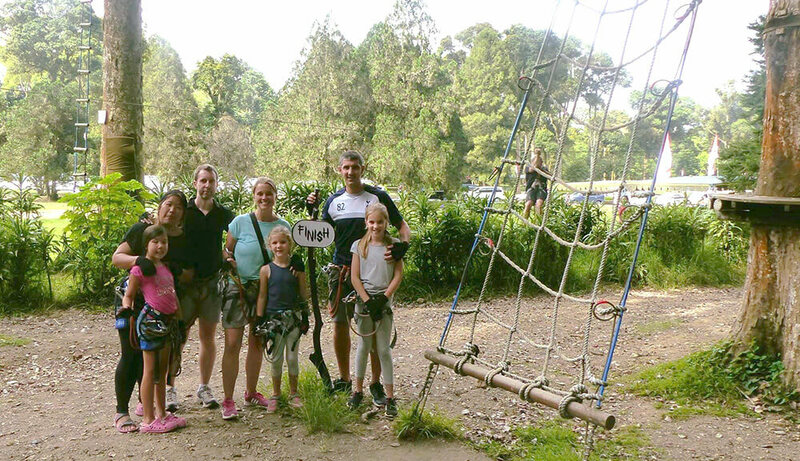 We even took a sojourn to the north of Bali to visit temples and do a treetop adventure thing (like Go Ape). Most of all we just relaxed. The weather in Bali is constantly a blissful 26-29 degrees, sunny and lush this time of year. You can understand why so many Aussies go there for holidays. Oh, and we also met up with a long-lost friend from uni whilst in Bali, and Roobs got to meet a CBBC wildlife presenter! We arrived in Brisbane a couple of weeks ago. We’re right in the north of the city, and we’re house-sitting for a Hungarian lady who’s gone back to Europe for a couple of months. We’re now looking after 6 cats and 6 chickens! Early impressions of Brisbane are good, the weather is similar to Bali but the whole environment is cleaner and more civilised. But it’s a LOT more expensive here, about 3x more expensive than everything in Bali. Not enjoying that at all, but at least we’re not paying rent here. It feels quite nice to be living a domesticated, suburban lifestyle again. It’s familiar, at least. Although I’m sure this feeling will wear off. I taught myself to swim. Living in a house with a pool meant I could finally get daily exposure to a swimming pool and really build some water confidence. I’d started doing this in KL but I found it really came together in Sanur. I spent ages literally just putting my face in the water, and getting used to it. Now I can like, properly swim! I even went to an adult swimming class in Brisbane last week to get some tips on technique. My front crawl still resembles drowning. I can swallow pills. This will sound really random. All my life I’ve struggled to swallow pills when needed. I even get friends and family to bring out those Nurofen Meltlet tablets that melt on your tongue. But for some reason this fear has simply gone away – I’ve been swallowing hay fever tablets fine whenever I need to. I can do injections. OK, I might not be completely over this fear, but in Thailand I had 3 injections in one session plus another two injections at later dates. I have such a fear of needles that this is actually a massive deal. After those 3 in a row, I realised that it isn’t so bad, and I can do it, even if I hate it. I’ve lost a stone in weight. Well, near enough. At my heaviest, I was 11st 10lbs in August last year. After changing the way we eat whilst in Hong Kong my weight has steadily come down and the last time I weighed myself I was 10st 12lbs. I was never overweight, but a combination of good eating, regular running and Hour of Power should mean I continue to look less like I’m pregnant with a food baby. Funny, one of the things that has really changed for me is my claustrophobia. Constant exposure to uncomfortably tight spaces in Asia has reduced it from “utterly crippling” to “more or less manageable”. Which is nice. I struggle with tablets…. Until recently I used to crush paracetamol between two spoons in order to take it with an orange juice chaser . All of these changes are amazing! Go Dan! Ah, thanks Lizzie. Crushed paracetamol and OJ sounds, quite frankly, disgusting. I have read every post on your blog and really enjoy your travelling adventures.